New Year’s Day (January 1st): This is the most widely observed feast day in Albania. Almost everything shuts down the afternoon before as people prepare food and get ready for the evening’s parties and firework displays. Festival of Wind Instruments: organized by the Regional Council. The next festival is likely to take place in September 2008. Traditional Cuisine Fair: another Regional Council event. The next Fair will take place in September 2008 along with the National Artisan Fair. Sotirë Village holiday (August 7-9): Visitors are welcomed with free food and drink. Gjirokastra Liberation Day (September 18th): Gjirokastra celebrates the day the town was liberated from the Nazis in 1944. Observances occur at various war memorials throughout the city and there is usually a musical program at the festival stage in the Castle followed by fireworks in the evening. National Liberation Day (1944) (November 29th):The main celebrations are at the Castle, with a musical program followed by fireworks. Flag-raising ceremony (December 4th): To commemorate the first raising of the Albanian flag over Gjirokastra in 1912, the year of independence. 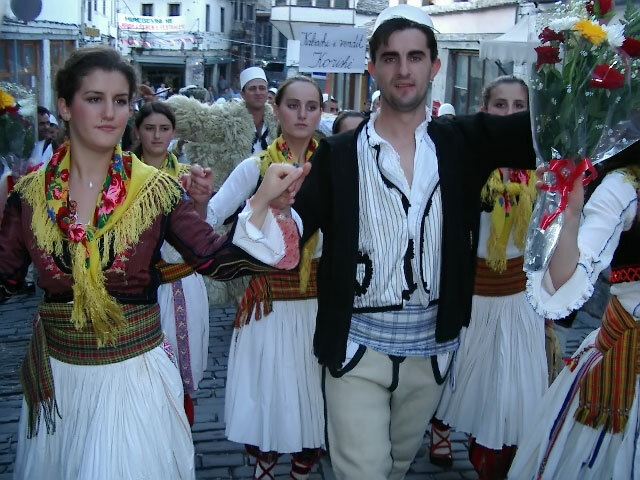 Gjirokastra is the home of an internationally famous festival of traditional Albanian folk culture. It takes place in the autumn of every forth year. The first festival took place in 1968 and it has since become the symbol of Albanian national folk culture. Held in the open air in Gjirokastra’s castle, it features the best of the Albanian folk traditions, including music, dancing, arts and crafts, and costumes. Over 1000 Albanian singers and dancers from Albania, Kosovo, Macedonia, Montenegro, Italy, Germany, Switzerland and the United States performed in the last National Folk festival from September 29 to October 5, 2004. The next is expected to be scheduled for the autumn of 2009. For further details or for exact dates please contact the Tourist Information Centre.